Video Conferencing Supply, the premier teleconference specialists, now carry a full line of Barco business projectors. Projectors improve the picture quality of video conferences, particularly in large spaces. This is why the specialists at Video Conferencing Supply have expanded their offerings by introducing Barco business projectors. Video conferencing has become an indispensable tool in the modern workplace. Whether in impromptu huddle rooms or spacious auditoriums, video conferencing has the ability to connect workers and solve the problem of distance. As the technology matures, companies are increasingly confronting the specific challenges of installing the appropriate video conferencing system for a desired location. Take large rooms. Monitors large enough to be seen by sizeable crowds can cost extravagant amounts. Video Conferencing Supply provides businesses with an unmatched selection of teleconferecing technology backed by the expertise only specialists can provide. Barco has been working with telecommunications since 1934, and is well-established as a worldwide leader in the field of video projectors. Barco business projectors solve problems that have limited the appeal of projectors in the corporate environment, particularly the combined issues of noise and brightness. Using advanced DLP (digital laser phosphor) units as light sources, the Belgian company has greatly reduced the noise level of their projectors. Ambient noise disrupts conversation, so by building quieter projectors, Barco is enhancing their use for teleconferencing. Barco DLP business projectors use lasers to produce illumination. Using lasers, which have no moving parts, reduces noise generated by the unit and provides a steadier, more reliable source of light. Barco DLP light sources can last for 20,000 hours or more while providing brilliant illumination. 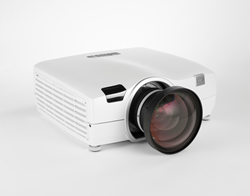 Video Conferencing Supply’s line of Barco business projectors have brightness ratings of up to 8,000 lumens. Video Conferencing Supply also stocks a wide range of lenses so businesses can get the perfect fit for their specific situation. More and more companies are adopting projectors as an integral part of their video conferencing deployment. Projectors provide a very large picture size for a reasonable price when compared with monitors. Video Conferencing Supply’s friendly support staff is here to answer your questions about their new line of Barco business projectors! Video Conferencing Supply is the pioneering video conferencing equipment reseller. As the first and largest specialty video conferencing reseller, Video Conferencing Supply features products ranging from inclusive video conferencing systems to all of the necessary components. Our wide knowledge base and dedicated customer support is unparalleled in the video conferencing market.